Anyone in the authoring and documentation industry has undoubtedly heard of “separating content, structure and layout”. But what does it actually mean to separate the “content” from the “structure”? Is it complicated? And most importantly, why should you do it and what do you gain from it? Everything at the same time and in one go? The “traditional” approach to preparing a manual is often to create your content in a word processor and save it as a file. Images are usually incorporated too. While preparing the text, in this same file you determine a structure for your running text, headings, subheadings, image captions, specific tips and information in the form of tables, etc. You also format your content in this file; for example, making headings slightly bigger and giving them section numbers, using italics for image captions and so on. Now let’s say you want to use the same information that already appears in your manual in other places, such as in the “Service” area of your homepage. Here the font should be different compared to the manual and the headings should be a different colour without any section numbering. You want to use the information from the image caption again, but it should appear when you hover the mouse over the image. What’s more, you’re also designing a brochure for the next trade fair, which predominantly consists of tips and notes, and it really needs to stand out and be eye-catching with large images and coordinated colours. You now need to create three (or more) documents, insert text and images three times or using copy & paste, and change the layout and formatting depending on the purpose. If something then changes, you’ll unfortunately have to first find all the documents, then open them again and update the section in question in each document. And if you want to make overarching changes to the design and layout of your documents – for example, as all your manuals will be printed in colour in future and the headings should therefore be in your company’s corporate colour – then these changes also need to be made manually in all the individual documents. The more publications and formats this affects, the more work is involved in managing your various information products. The structure is defined separately. This determines the composition and possible components of a document type: heading, running text, image element, image caption, tip element, etc. However, at this level it is not determined what these components will look like in the specific document or what actual text will appear. The content is gathered. In other words, the actual information or data used to “fill” the structural elements – text, images, videos, etc. – is saved as modules. At this level too, it is not yet determined what the content should actually look like. The layout is also recorded independently. This means the information about the way in which the content is displayed in the structural elements; for example, in two columns, bold, light blue, in Arial font, etc. This “separation” might sound more complicated than it actually is, as with XML there is already a conventional format for creating and saving information in isolation as described above. 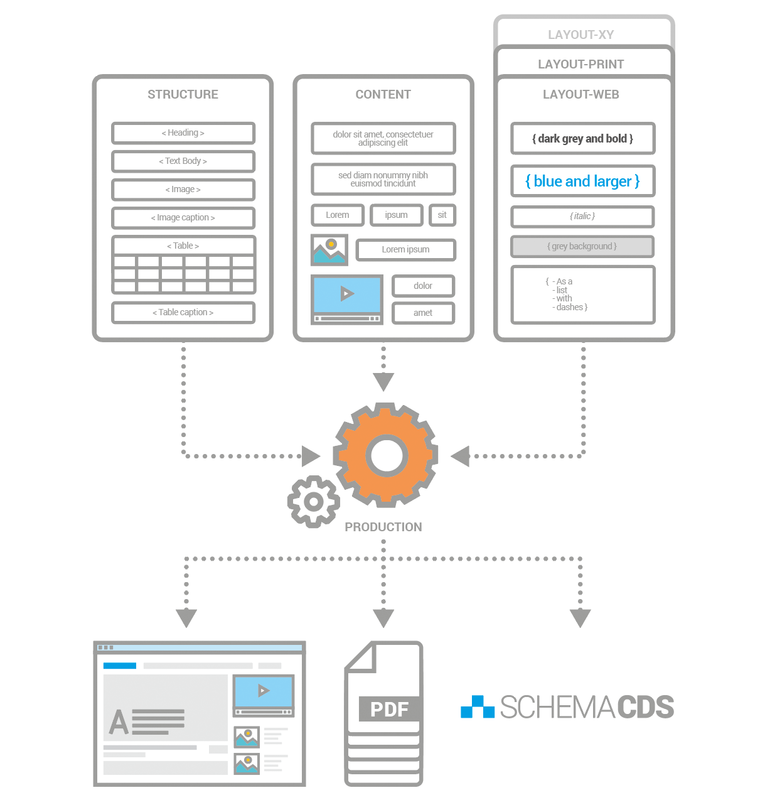 A component content management system like SCHEMA ST4 enables you to separate, manage and merge this information conveniently and as desired. Single source publishing: one for all and all from one! Of course, in actual publications the structure, content and layout have to be combined again. However, by storing the data separately, this is much easier to do. As the content is saved as modules and independently of a specific document structure, you can use a content module in different publications and even different media – in the manual, in a second manual for a variant, in a brochure, on the homepage, in an app, etc. This process is also known as single source publishing: many publications are populated from a single source. This also means that different structures can be defined for the same content; for example, an item of text that is a subheading in a general manual can be the main title of an entire specialised brochure or a product leaflet. As the content only needs to be saved in one central location, you only need to make changes and updates to one content module. All publications that use this content module are automatically updated at the same time. The single-source principle also makes it easier to prepare translations, as the modular content only needs to be translated once and can then be used in many places and in various structures. As the layout is saved separately, you can also use it for several publications, such as for other variants, for new products, for the latest events or occasions – once created, you can easily link the layout to every new publication. Manually defining the layout of certain elements, such as images, is always time-consuming and difficult using the “traditional” approach. But once you’ve created an independent image layout, your figures and images will always automatically be handled in the same way. Do you need to adapt a layout to match your corporate design or are you planning a fresh new look for your information product? Even if changes like this affect numerous publications, they can be implemented quickly by simply adapting the independent layout – the specific publications will automatically be changed at the same time. You gather content and re-use it in all the desired publication formats. You create layouts for all the desired publications and use them again and again; one layout for all manuals, one for all brochures, one for all websites, and so on. You can develop several document structures per publication and use your content flexibly within them. Your data is stored in a much clearer way, as you only create content once. You have more flexibility when it comes to creating variants and new publications, yet retain a professional, uniform document format. You save time on making changes to and updating your content and your layouts. You increase satisfaction among your customers and partners, as you work more quickly with a significant improvement in quality. Incidentally, in SCHEMA ST4, despite single source publishing, you can continue to use Microsoft Word as an editor! Although the concept of separating content, structure and layout may seem somewhat complex at first sight, it is easy to implement with a component content management system and takes your documentation to an entirely new level!